This beautiful Scott Kay engagement ring setting SK M1227RD10 is from the Vintage Collection and features a diamond halo surrounding the center stone of your choice. It has pave diamond shoulders as well with engraving and milgrain detail for a touch of elegance. 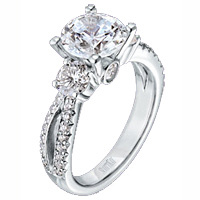 If you’re looking for an engagement ring that is sure to impress her, then look no further than Scott Kay. His motto, “Never compromise”, ensures world-class jewelry that holds itself to a unique standard of durability, craftsmanship and aesthetic appeal. The celebrated jewelry designer says of his jewelry, “Don’t try to sell the whole world. Don’t keep jumping all over the place. Find something that is your vibe, your language, so that other people can see what inspires you.” The same could be said for shopping for engagement rings! Scott Kay 1.06ct Split Shank Pave Setting. This gorgeous setting is perfect for a larger diamond. It features a split band with small pave-set round diamonds. 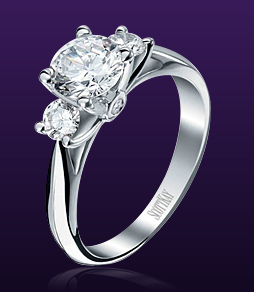 A single large prong set is placed on either side of your chosen center diamond. Definitely one of the more extravagant choices Scott Kay has to offer. 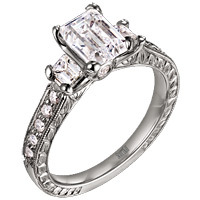 Scott Kay .87ct Vintage Style Princess Cut Setting. This excellent setting from the Scott Kay Vintage Collection features scroll engraving on either sides of the band, as well as two larger prong-set princess cut side stones. For added elegance, there are also smaller channel-set princess cuts going half-way around the band. 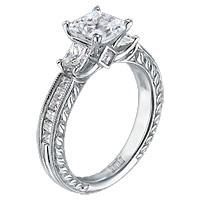 And for extra chic appeal, two princess cut “surprise” diamonds are placed on the top and bottom of the setting. This is a great, classic choice for those looking for a ring with a rich timeless appeal. Scott Kay Emerald Cut Setting with Pave Diamonds .57ct. A stunning engagement ring choice, this piece features an emerald-cut side diamond on either side of your choice of a center diamond. Why not go big for such a beautiful ring? 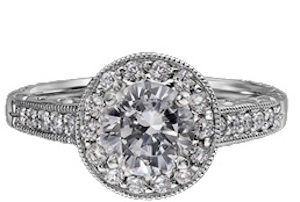 Additionally, 10 beautiful small round brilliant diamonds are encased in pave settings on the band. Jewelry pioneer Scott Kay formed an unlikely alliance last year with a metal maker and fabricator to produce a new white metal that is (incredibly) more durable than Tungsten Carbide and costs only a fraction of the price of platinum. Kay was incensed last year when he started researching the “indestructible” durability of industry standard, tungsten carbide. When he discovered that tungsten was in fact destructible and that there was possibly a stronger metal out there, Kay set out with metallurgists to find such a metal. In late Fall last year, Kay unveiled the new metal, BioBlue 27. The unique material is bright white, more durable than tungsten carbide, and consists of 64 percent cobalt , 29 percent chromium, and 6 percent molybdenum. It can also be cast or milled and inlaid with precious metals, which helps Scott Kay make some of his finest and most stunning jewelry items. Kay released the unique Cobalt Bridal line late last year, which features men’s engagement rings that are sturdier and more durable than almost anything out there and come in the brilliant cobalt white metal. Things are changing in the wedding and engagement ring world. Nowadays it’s not enough for only the woman to have an engagement ring. Guys are getting theirs too. Jewelry designer and industry leader Scott Kay came out with a line of the so-called “man-gagement” rings, or men’s engagement rings, just last year. 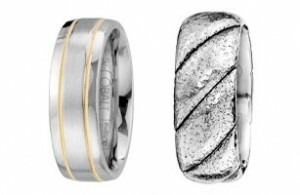 Presenting a new cobalt alloy dubbed “SK Cobalt”, Scott Kay has released his forward-thinking men’s wedding band collection with a bright white look, a contemporary flair that makes these men’s engagement rings look cool, as well as timeless. The jewelry designer himself noted how much he was inspired this bright white cobalt look for this collection. He also was sure to note how another low-priced bridal band material, tungsten carbide, was weaker than reports have claimed. Kay patented the material used to compose the bridal bands himself, in an unprecedented partnership between the jewelry designer, a metal and jewelry manufacturer, and a steel company, Carpenter Technology Corp., which manufacture hundreds of alloys for everything under the sun. This unique Scott Kay engagement ring features round brilliant cut pave set diamonds on three sides of the band crisscrossing under the bottom of the center stone. Available in palladium, platinum, 19kt white gold or 19kt yellow gold and can accommodate a round brilliant or fancy shape center stone from .40ct to 4.20ct. This stylish Scott Kay engagement ring features 2 baguette shaped bar-set diamonds and 3 round brilliant cut pave-set diamonds on either side of your choice of a center stone. 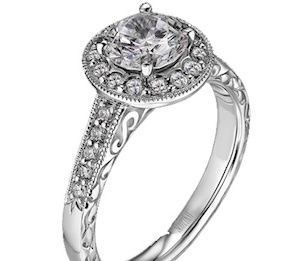 It also features the signature Scott Kay surprise bezel set diamonds below the basket on either side of the setting. Available in platinum, palladium, 19kt white gold or 19kt yellow gold and can accommodate a round brilliant or fancy shaped center stone from .60ct to 3.20ct. This amazing Scott Kay engagement ring is from the Vintage Collection and features two round brilliant cut prong set side diamonds and round brilliant cut pave-set diamonds with beautiful scroll engraving around the band. It also features the signature Scott Kay “surprise” diamonds which are bezel set in the bottom of the mounting. Available in Platinum, Palladium, 19kt White Gold and 19kt Yellow Gold it can accommodate a round brilliant or fancy shaped center stone from .60ct to 6.20ct. This beautiful Scott Kay engagement ring is from the Scott Kay Vintage Collection and features two prong set Princess shaped diamonds set on either side of the center stone and smaller Princess shaped channel-set diamonds going half way around the band. The band also features beautiful scroll work and the Scott Kay signature “surprise” diamonds. Available only in 19kt yellow gold and can accommodate a Princess shaped center stone from 1.20ct to 3.60ct. This beautiful Scott Kay engagement ring is made in 19k yellow gold and features a split band with small pave-set round brilliant cut diamonds and larger prong set round brilliant cut diamonds on either side of your choice of a center diamond.